The Big Green flashed its potential in a pair of games before Christmas, holding its own in a tough loss against the University of Notre Dame before downing Bryant University at home 75-58. But Dartmouth’s weaknesses were on full display in a Dec. 30 , 2017 loss to then-1-10 University of New Hampshire. The Big Green allowed 1.30 points per possession and shot just .235 from behind the arc. Dartmouth begins Ivy League play on Saturday against a Harvard University team that has underachieved at 5-9. The Crimson has lost three straight, most recent a six-point home loss to the University of Vermont. Harvard has been without defending Ivy League Rookie of the Year Bryce Aiken for those three games, though Aiken is expected to return to the court for the conference opener. Aiken’s absence and some hot shooting against a stout Harvard defense could spell a Big Green win—but don’t count on it. Head coach Belle Koclanes has something cooking in Hanover. Dartmouth posted Ivy League records of 2-12, 5-9, 7-7 and 3-11 during Koclanes’ first four years at the helm. Now the team is off to its best non-conference start in 11 years. But a pair of losses to quality opponents—first to then-11-2 University of Albany and then to 9-4 Binghamton University—has dropped the Big Green to 8-5. Cy Lippold ’19 emerged as a leader on both sides of the floor, leading the team with 13.8 points per game after averaging just over two points per game last season. 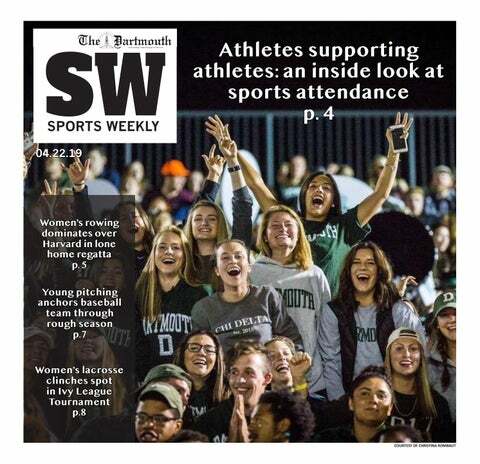 Isalys Quiñones ’19 and Kate Letkewicz ’18 have remained impact players for the Big Green. Harvard University comes to Hanover at 7-5 following a New Year’s Eve win over Stony Brook University. Senior guard Taylor Rooks has found a groove lately, scoring double figures in each of the past three contests. Saturday’s game may come down to a battle between Harvard’s conference-best shooting defense (.372) and Dartmouth’s conference-best shooting offense (.425). After its strongest three-game stretch of the season, which included wins over then-No. 2 Denver University and then-No. 16 University of New Hampshire, the Big Green looks to carry its momentum into weekend matchups with conference opponents Union College and Rensselaer Polytechnic Institute. Union is second in the Eastern College Athletic Conference with an in-conference record of 6-2, though they have lost three straight games overall. The Big Green will look to expose Union’s defense, which has let up the third most goals in the ECAC through all games. In its second matchup of the weekend, Dartmouth faces a struggling RPI, which comes into this weekend with an overall record of 3-13-3. With just five league points each, Dartmouth and RPI will be looking to propel themselves ahead of the other in the conference standings. Dartmouth hosts Union and RPI at home at 7 p.m. on Friday and Saturday, respectively. Sitting at the bottom of the Eastern Conference Athletic Conference standings with just two conference points, women’s hockey looks to end its struggles in Schenectady, New York against Union College on Friday. Union, currently tied-for-ninth in the ECAC, will be playing in its first game since Dec. 16, 2017. On Saturday, the Big Green will travel to Troy, New York to take on Rensselaer Polytechnic Institute in a matinée conference battle. RPI will look to rebound against Dartmouth after tough losses to two consecutive top-10 opponents. Currently 4-3-1 in the conference, RPI will try to gain significant ground in the ECAC, where it is tied-for-seventh with nine points. The Big Green head into the weekend at 1-7 in the conference and the lowest scoring offense in the league. The men’s swimming team hosts Ivy League rivals University of Pennsylvania and Yale University this weekend in its first meet of the new year. The action begins on Saturday with diving only, while the rest of the competition concludes on Sunday. Men’s swimming and diving enters the contest at 1-2 overall and 0-2 in the Ivy League. The Big Green beat Boston College in its first meet of the season on Nov. 4, 2017 before losing to rivals Harvard University and Cornell University. In December, the team competed in the Big Al Invitational hosted by Princeton University, where it placed seventh. The men look to get back on track this weekend with the bulk of their season looming ahead. Women’s swimming and diving also competed in the Big Al Invitational, placing sixth but have yet to compete against any individual schools. The women are looking for their first win of the season against Yale and Penn, who are currently third and fourth in the conference, respectively. This home meet serves as a warm up for the Dartmouth Invitational, which will take place in two weeks. Men’s and women’s track and field will ring in the new year at home, hosting the 49th annual Dartmouth Relays this Friday through Sunday. The meet, which is the largest athletic event hosted by the College, features three days of collegiate, high school and open competition. Both teams will hope to record top times and give strong performances as they prepare for the Indoor Heptagonal Championships in late February. Both teams have competed twice this season, opening at the non-scoring Boston University Season Opener on Dec. 2, 2017, and then hosting the University of Maine, University of New Hampshire and University of Vermont at Leverone Field House on Dec. 9, 2017, where the women placed first while the men placed second in team competition. The teams will face off against other competition in the Northeast at the Dartmouth Relays. The meet kicks off with high school competition on Friday and Saturday. Collegiate competition begins Sunday.